Yeppers! 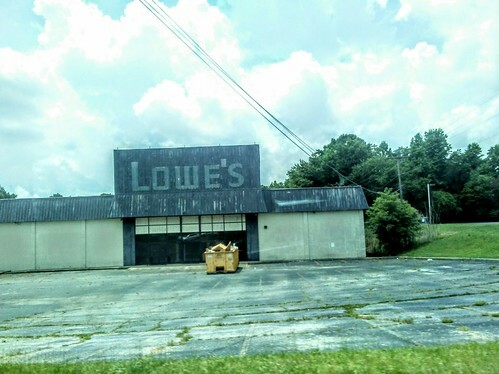 It was like one of the oldest Lowes stores in Kannapolis, similar to the one on Jake Alexander Boulevard in Salisbury. The time for moving came in the 2000s when Lowes moved to a new store on Dale Earnhardt Boulevard, west of the Exit 60 interchange with I-85 in Kannapolis. When the older store was vacated, a mattress store had a brief time in the old building before deciding to close up shop altogether. And the old Lowes remain vacant, after 2 stores either moved and closed. Improving Home Improvement in this vacant old building? No! Destroyed Home Improvement, in the old Lowes, in the K-Town.